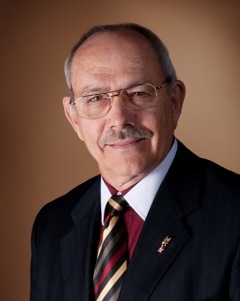 James Gardner is a speaker for Answers in Genesis and the Institute for Creation Research. He is also the founder of his own ministry to spread Biblical teachings called Canopy Ministries. As a child he accepted Christ but was indoctrinated with evolution when he entered public school. It was not until his family was struck by tragedies that he returned to God for answers. His questions were answered in Ken Ham's book The Lie: Evolution. Following this he joined several tours with the Institute for Creation Research. For the next 15 years he studied evidence for creation and apologetics. For a number of years he owned an electronics business, and after retiring began his own ministry where he serves as a speaker and CEO . James Gardner is currently a speaker for Answers in Genesis, Institute for Creation Research, and Canopy Ministries. He has a small aircraft which he uses to fly around the country and world for his lectures about Creation vs Evolution. He has been teaching and lecturing since 1993 in schools, churches, and even colleges about Creation vs Evolution. One topic he discuses often is about the Grand Canyon. Having visited the Grand Canyon 14 times in the past 17 years which has provided him with extensive training about the Grand Canyon and how Noah's flood fits into it. He has also gained extensive knowledge from his visits to Yellowstone. James Gardner founded Canopy Ministries with the mission of teaching "Biblical truth to the next generation". Now he travels around the world teaching about various topics for his own ministry as well as for Answers in Genesis. He covers a variety of subjects but mostly teaches about geology and biblical truths. Some of his most praised topics include discussion about dinosaurs, fossils, Grand Canyon, and the Flood. Dinosaurs and Dragons—Fact or Myth? Using Their Own Words Against Them! ↑ 1.0 1.1 1.2 James Gardner Answers in Genesis. Web. Last accessed 15 October 2014. ↑ 2.0 2.1 Speakers Canopy Ministries. Web. Last accessed 15 October 2014. ↑ Mission Statement Canopy Ministries. Web. Last accessed 15 October 2014. This page was last modified on 3 November 2014, at 09:10.